2013 was a great year at les Sarziers. Changes, renewals and some memorable events made for a very special twelve months. January kicked off with the new Doghouse roof and the final touches to the restored garden. In the Spring we welcomed several Walksweeks groups who enjoyed fantastic weather and perfect walking. Then there was the usual buzz of the Ardéchoise, which passed through Arlebosc for the first time this year. The big event in June was the return of the Mastrou and the start of our regular Tuesday trips to Lamastre on the market train. July saw the publication of Welcome to the Free Zone and all the excitement and events associated with the launch. But the absolute highlight of the year was without doubt the wonderful celebration of 25 years at the house with Jazz aux Sarziers on August 4th. We have lots of exciting plans for next year – watch this space! We wish you all a very Happy Christmas and a wonderful New Year and we hope to see you soon with us at les Sarziers. 12,952 cyclists – it’s the Ardéchoise! They’re back! 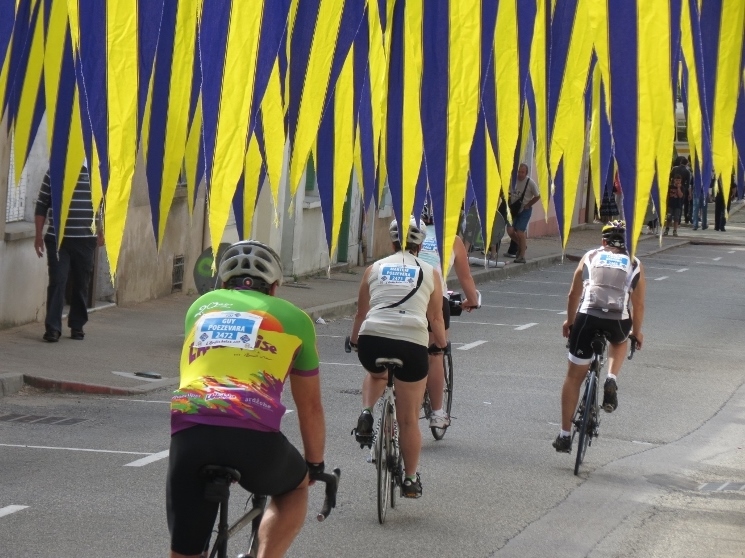 The 22nd edition of l’Ardéchoise is into its final day, with nearly 13,000 participants pedalling all over the department. As in previous years, we have a vélomane staying at les Sarziers who will be returning this afternoon from his four day tour to enjoy a celebration barbecue with us in the garden. The weather is perfect and the welcome from towns, villages and little hamlets all over the Ardèche has been as warm and enthusiastic as usual. Our Walksweeks guests too are enjoying the buzz in the villages they pass through. This was the atmosphere in Lamastre this morning, (for a slideshow, click on one of the pictures). There was big excitement in Lamastre this Tuesday as the Critérium du Dauphiné rolled into town for the start of its second day stage. This prestigious race is seen as a dress rehearsal for the Tour de France with the teams and competitors measuring their strengths in terrain which closely matches many stages of the Tour. Lamastre has never hosted a professional cycle race and had taken the unprecedented – and controversial – step of moving the weekly market day to Monday in order to accommodate the event. We were very impressed with the slick organisation as the colourful team buses rolled into the big market square, each followed by the support vehicles and spare bikes. We were also amazed to be able to walk about freely amongst the teams and sportsmen, who appeared very relaxed, signing autographs and chatting before heading off for the official formalities at the start of the race. Here are a few of our impressions. For Bradley and Team Sky this was a foretaste of the Tour, for us in the Ardèche it was the start of the cycle madness of the Ardéchoise, which starts tomorrow. This event, now in its 21st year, is the largest of its kind in Europe bringing together thousands of cyclosportives and cyclotouristes and is a huge moment in the local calendar. Participants can choose to follow a four, three or two day touring programme and the culminating race, on Saturday, can be undertaken in longer or shorter stages. We have three vélomanes staying at les Sarziers before setting off on the four day 500km loop back to St Félicien. They are delighted with the area, the stunning landscapes, and the wonderful flowers and can’t wait to get started.